Things are getting ugly in Wollongong. Politics down south of Sydney has been a pretty rough trade of late. Between the Wollongong Council ICAC investigation and the resignation and outing of David Campbell (then member for Kiera) it's been rough sailing for Labor in those parts of late. Going into the election, Keira, Shellharbour and Wollongong were all "safe" Labor seats. I say "safe" because very few seats were actually safe given the swings that some people were expecting. Not only was Labor on the nose, but many people thought that David Campbell debacle would hurt Labor, even though some sympathised with him after the way Channel 7 handled his outing. In the event, Labor held all 3 seats, but with drastically reduced margins - in Shellharbour a margin of 21.6% was reduced to 8.6%, in Keira, a margin of 22% was reduced to 3.9%, and in Wollongong Noreen Hay held on by the skin of her teeth, her 25.3% margin having been decimated to lie at 1%. It was so close in Wollongong that her independant opponent, Gordon Bradbery, in fact claimed victory on the night, despite sitting on a margin of 0.4%. It took some five days before Hay called the media to claim victory by a mere 650 or so votes. Even on the day of the Election however, there were rumblings of discontent. This article explains that the Liberals had been advocating a "vote one" strategy - meaning that they were asking voters to only number the box next to the Liberal candidates name. The allegation (made initially by the Liberal party, and apparently the subject of a complaint to the NSW Electoral Commission) was that Labor had stolen some of those cards and hand amended them to ask voters to place a "2" next to Noreen Hay's name. The above photo is one of the allegedly doctored How To Vote Cards. Hay denied any knowledge of the incident, despite the fact that the doctored cards were said to have been found hidden amongst Labor's campaign material. 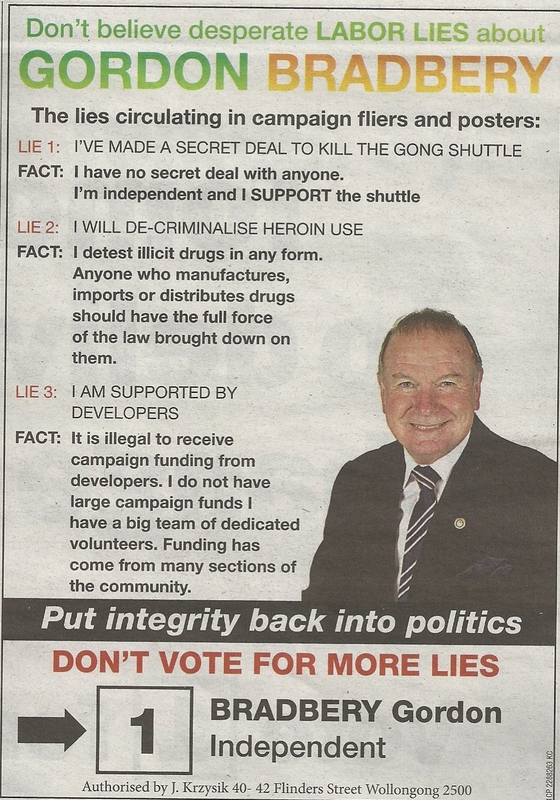 The campaign has already gotten rough - thanks to the very excellent ElectionLeaflets.org.au we can see this leaflet that Gordon's supporters delivered during the campaign. Unfortunately no one has uploaded the original Labor leaflet, but I think we get the idea. The Daily Telegraph reported this week that Gordon Bradbery had filed a complaint with the Court of Disputed Returns. The NSW Parliament website helpfully provides a copy of the document here. a) At least 800 fraudulent how to vote cards were found at a polling booth at Farmborough Road in the seat of Wollongong on the day of the election. These cards which were repeatedly handed out to voters and falsely directed preferences to Ms Hay. b) A high incidence of double voting occurred in the election in the seat of Wollongong, particularly as a result of voters in nursing homes lodging postal votes and voting a second time on polling day. The Second Respondent failed to accurately identify and take into account double voting prior to the declaration of the poll by the First Respondent on 5th April 2011.
c) A number of posters erected on and before polling day in the seat of Wollongong, some of which displayed Labor party authorisation, instructed voters to "Just Vote 1". The potential for voters to misinterpret these posters as an official directive from electoral authorities was such that the result of the election by may have been affected. Time will tell how many of these allegations he will actually be able to prove. The way b) is phrased it it sounds like it is simply a criticism of the NSW Electoral Commission procedure. The first allegation really is the big ticket item. If true, it shows a shocking course of conduct by at least one person in the Labor party - and the question will then be "How high does it go?" If there is a whistle-blower willing to say that Hay knew about this - well, let's just say that it should be excellent viewing.